The potential benefits arising from the action are substantial for road operators and road users as well. The primary use of such indicators is for the comparison of different road networks and the identification of investment requirements where relevant minimum standards have been defined taking into account the requirements of road users. For the development of international standards regarding to road pavement condition harmonized performance indicators are an essential prerequisite. In this context they can be used on the one hand for international and national road audit but also on the other hand for widening the market for supervision and construction within Europe and thus strengthen the competition. Performance indicators can be used in particular as target criteria in life cycle analyses within the context of pavement design and/or systematic road maintenance at the national and the European levels. Uniform performance indicators permit an evaluation of the effects of different design and maintenance strategies but they can also be used for predicting road performance and for improving and developing new prediction models. Performance indicators are thus an objective tool for use in road construction and maintenance at various administrative levels, from local roads to international highways. A further benefit will arise for the road construction industry. 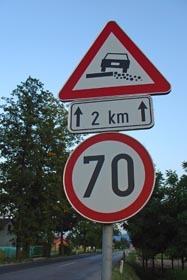 In connection with increasing privatisation of road construction and maintenance in Europe, the objective assessment of condition or performance indicators is gaining special importance. Such indicators may be used in awarding maintenance contracts to private enterprises and, in particular, within the framework of the new awarding procedures being contemplated in many European countries (private-public partnership contracts PPP, build-operate-transfer contracts BOT). Clearly defined harmonized performance indicators are an important precondition for the successful application of these new types of contracts.